According to a new report North America Cloud Field Service Management Market, published by KBV research, the North America Cloud Field Service Management Market would witness market growth of 16.5% CAGR during the forecast period (2017 - 2023). The US market holds the largest market share in North America Cloud Field Service Management Professional Services Market by Country in 2016, and would continue to be a dominant market till 2023; growing at a CAGR of 18.2 % during the forecast period. The Canada market is expected to witness a CAGR of 27.1% during (2017 - 2023) in North America Cloud Field Service Management Managed Services Market. Additionally, The Mexico market is expected to witness a CAGR of 25.9% during (2017 - 2023). The Manufacturing market holds the largest market share in North America Cloud Field Service Management Market by Vertical in 2016, and would continue to be a dominant market till 2023; growing at a CAGR of 14.5 % during the forecast period. The Healthcare market is expected to witness a CAGR of 16% during (2017 - 2023). Additionally, The Retail market is expected to witness highest CAGR of 19.3% during (2017 - 2023). The Large Enterprises market holds the largest market share in Mexico Cloud Field Service Management Market by Organization Size in 2016, and would continue to be a dominant market till 2023; growing at a CAGR of 15.9 % during the forecast period. The Small & Medium Enterprises market would attain market value of $29.9 million by 2023. The market research report has exhaustive quantitative insights providing a clear picture of the market potential in various segments across the countries in the region. 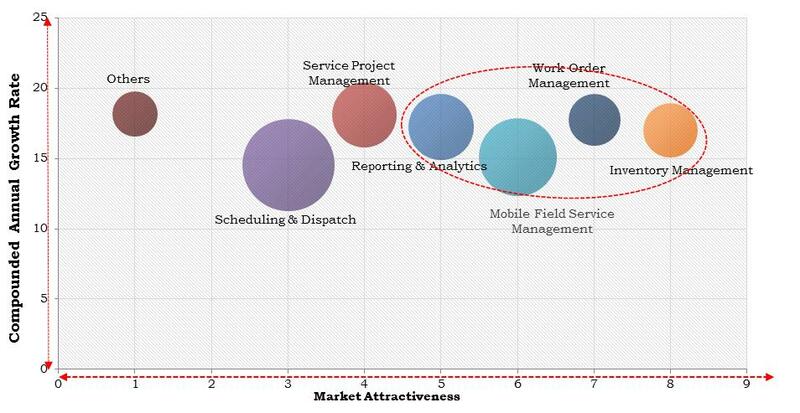 The key impacting factors of the North America Cloud Field Service Management Market have been discussed in the report with the competition analysis and the elaborated company profiles of SAP SE, Microsoft Corporation, Servicenow, Inc., Oracle Corporation, IBM Corporation, Servicepower Technologies Plc., Clicksoftware Technologies Ltd., Salesforce.Com, Inc., Acumatica, Inc., and Astea International Inc.